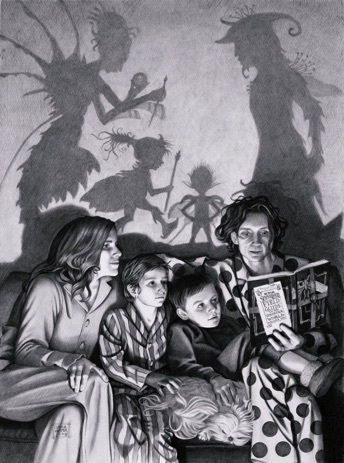 From 1966 to 1989 black and white illustrations in graphite was the only medium I worked in. Then I decided to dabble in color. I would do the illustration in graphite or charcoal and then make a photographic sepia tone print then hand tint it in oils like they used to do on old photo portraits. The result was beautiful. 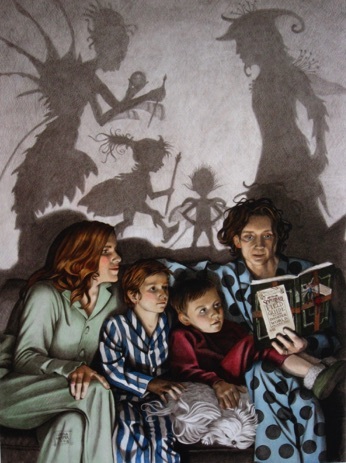 This was produced for an invitational art show about family reading that was held at the Carnegie Center in New Albany, IN. While at the library I saw the book "Arthur Spiderwick's Field Guide to the Fantastical World Around You" and an idea was born. I got the family down the street to pose and my little dog had to get into the act, she is such a ham. They wore blue jeans and plaid shirts which I made into pajamas. Spiderwick Adventures - Sepia tone photo with hand tinting in Marshall oil paint for photos. This process is a little tedious but gives a dramatic effect. Since the values are already there all that is needed is flat transparent paint to be applied with cotton balls or a soft rag. Wiping more off creates a lighter shade. The Lincolin Park Zoo in Chicago was a client of ours when I worked for an ad agency in Chicago. 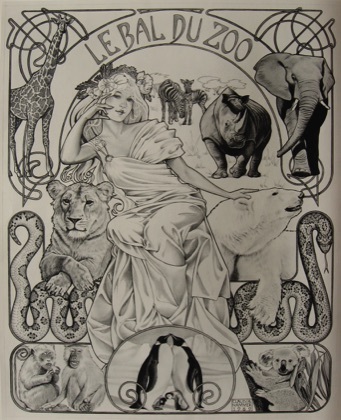 This was the original drawing for the invitation to a fund raiser for the zoo. 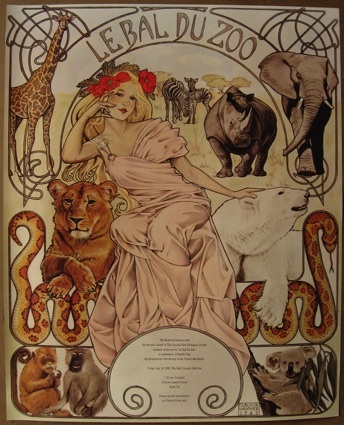 Le Bal Du Zoo - Hand tinted sepia toned photo 18" x 24"
This color version was was the invitation, printed as a poster and sent rolled up in a tube to everyone on their mailing list. A small version was printed on the front cover of the booklet program and the penguins were on that image instead of the worded invite. The sepia tone gives it a warmth and aged feel.